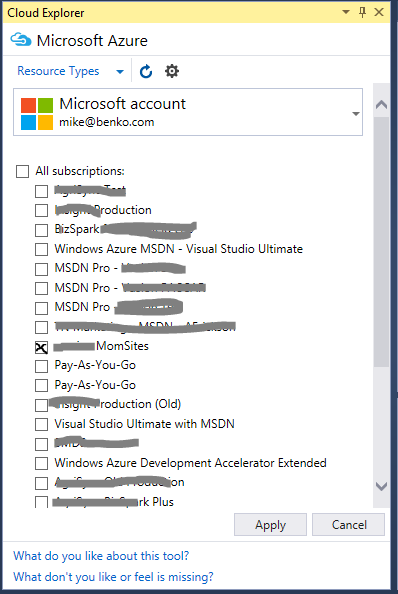 I like to think of myself as an early adopter, but I’m a month behind in getting the latest set of tools for Visual Studio 2015 and Azure. One of the great additions is the Cloud Explorer, a new utility for managing services provisioned in the cloud. 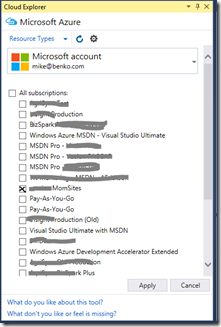 These have been well documented by my friend Brady on the Azure Blog, but one of my favorite things is the ability to filter subscriptions and/or search for a named service. With it I can click the settings icon, pick the subscription I am working with from a checkbox list. I can also specify a different account which might be associated with a different set of subscriptions. Once I’ve specified which subscription I am working with I get a filtered list of services grouped by type. These include things like Storage Accounts, Databases and Web Apps, as well as other services or automation jobs I’ve created. To make it even easier I can search for a specific name of something with the search box! 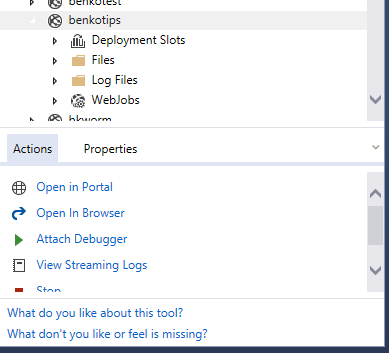 Once you find what you’re looking for the Actions/Properties box at the bottom of the explorer gives you options for that as well, including the ability to see the logs or attach a debugger. You’ll want to try these out, especially if you’re managing a lot of services. Get it today by clicking one of the links below. Enjoy! 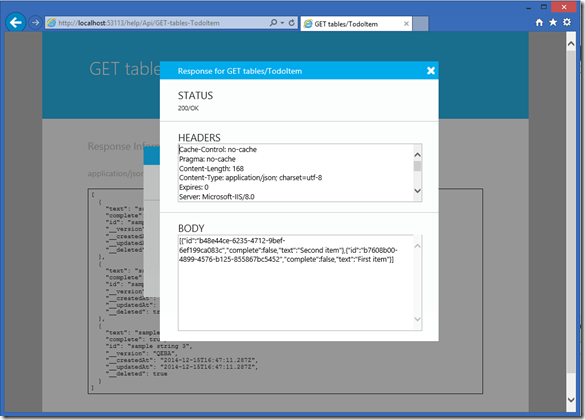 I’ve been working on a project using Xamarin.Forms and Azure Mobile Services for a while, and one issue I came across that wasn’t entirely clear is how do you work with an existing database, yet support updates to the tables and be able to deploy to different environments (like Test, QA and Prod)? Hopefully I can shed some light with this post. I added a couple additional changes to set the schema name for my app in the MobileServiceContext.cs file (in the Models folder). 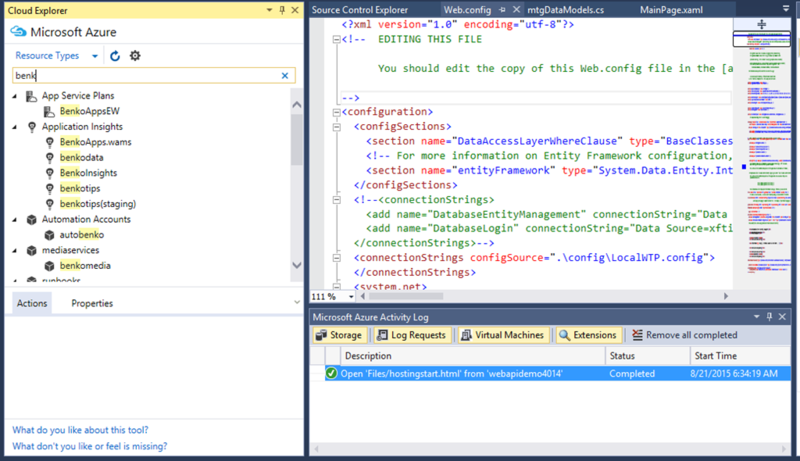 When you publish the mobile service it will attempt to update the database using the schema provided. 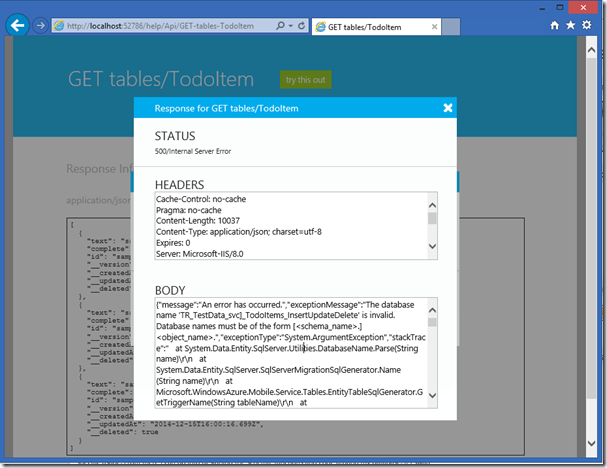 If there are error you can use the service’s logs to figure out what’s missing. By specifying the schema name instead of using the service’s name I’m able to deploy to multiple environments but integrate this data with my other applications. 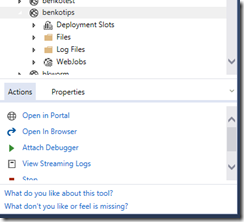 In my last role at Microsoft as an Azure Evangelist I posted a series of cloud tips, which were intended to be quick tips for using the latest tools & services. 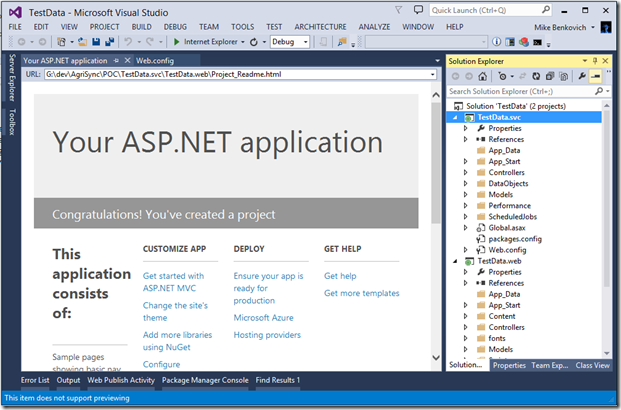 This one is the next in that series, and focuses around some esoteric gotcha’s that come up when you’re following a convention for organizing your solution in Visual Studio. As you probably are aware you can have multiple projects in a solution, and one approach for keeping them organized is to follow a naming standard that uses a dot-syntax to keep related related things in their right spot. 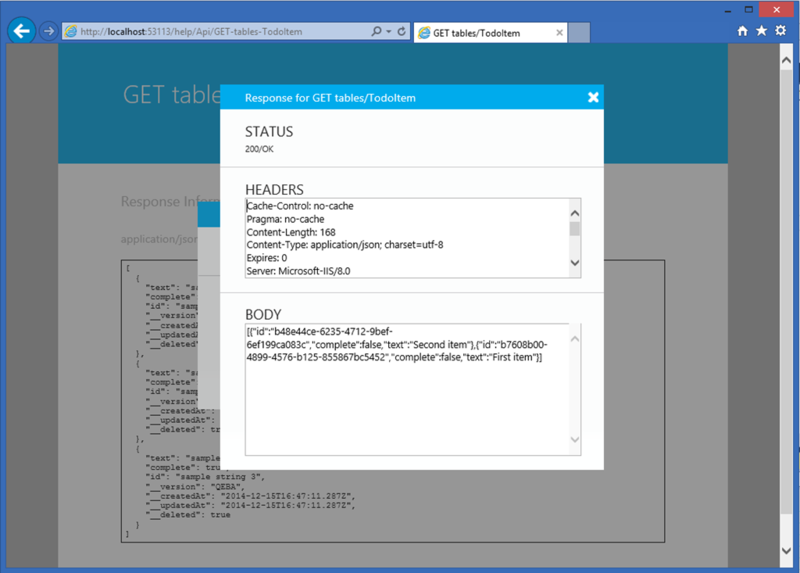 For example if my project is a solution to a to-do list, I might create the solution called “TestData”, and within that solution have a project for the web called “TestData.web” and a shared project called “TestData.shared”. Following this convention it makes sense if I want to add a data service project I might call it “TestData.svc”, right? When I try this out and build it, I was finding an error that took longer to expose than I had planned, and that’s the focus of this post. I started with this solution and added some custom classes to the data tables to work with my TestData and found that I was getting errors. The Mobile Services project type includes a testing page that allows me to try out the service and test the calls to my data, which is great. But I found that I was getting an error when I was running the project without adding or changing anything…Isn’t the stuff supposed to work “out of the box”? 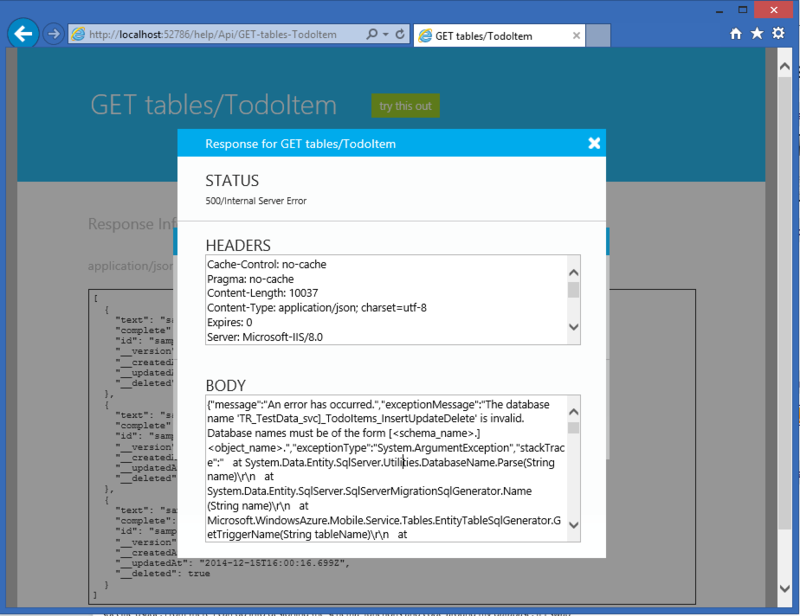 Instead I get the error - “The database name 'TR_TestData_svc]_TodoItems_InsertUpdateDelete' is invalid. 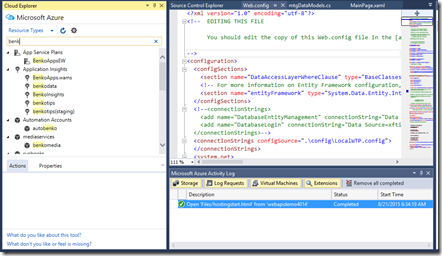 Database names must be of the form [<schema_name>.]<object_name>”. What does this mean??? 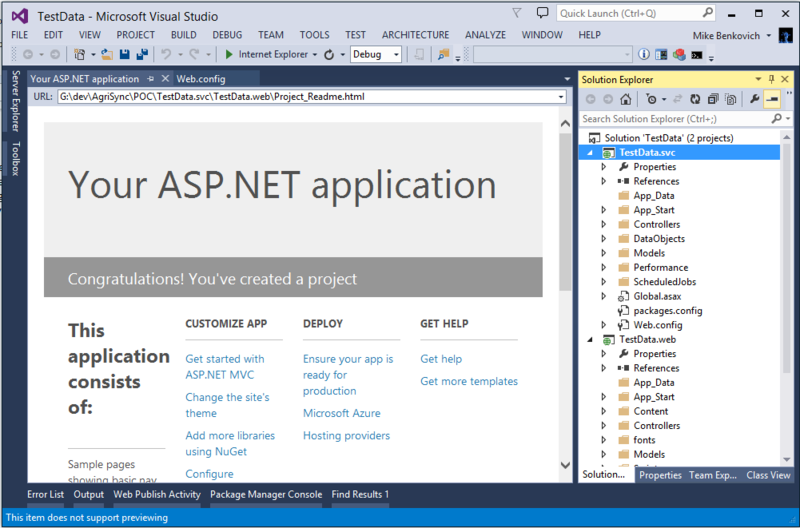 It looks like something’s not right with EF, so I tried updating my NuGet’s to make sure I have the latest packages…Right click the project explorer and go to the NuGet page and try update packages…this is the wrong thing to do because the template was created using specific versions of specific packages, and while some can be updated others shouldn’t. This time I get an error that the JWTSecurityTokenHandler is broken. After some digging I found a StackOverflow post that answers this. In particular I find that EF is unhappy with the latest MobileServices entity versions so in the NuGet Package Manager I need to uninstall the WindowsAzure.MobileServices.Backend packages and install the specific version 1.0.342. The problem isn’t with EF or out of date packages, it has to do with the local database name not being recognizable with the dot-syntax naming convention (another StackOverflow post). In the web config you can fix it by removing the period in the names, or you can do what I did which is just recreate the project without the dot name and test to confirm it’s working, and then rename the services project in the solution. And it works! Time to go and write some code.